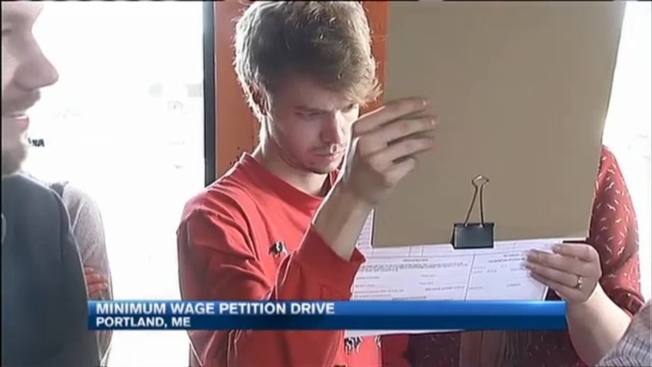 A petition drive is underway to raise Maine's minimum wage. The Maine People's Alliance is collecting signatures to get a referendum question on the November 2016 ballot that would raise the wage from $7.50 to $9 an hour in 2017, and then incrementally increase it one dollar more each year, until the minimum wage is $12 an hour in 2020. "We know this is an issue that impacts Mainers from Kittery to Fort Kent," said Amy Halsted with the Maine People's Alliance. "Any increase in the wage is what Mainers want." The MPA needs to collect more than 60,000 valid signatures to get the question on the ballot. It's not the only effort to raise the wage in Maine. Portland City Councilors are considering an ordinance that would raise the wage in Maine's largest city to $8.75. Portland's Green Party supports a measure to raise the city's minimum wage to $15 an hour. Maine's Republican Governor Paul LePage has vetoed legislation to raise Maine's minimum wage, saying it would hurt small businesses and Maine's elderly population living on fixed incomes. Some small business owners are concerned that these proposals increase the wage too quickly. "It should definitely be incremental and small," said Havens Candies owner Erin Collins. "I think we need to come together and make sure Maine is making the right decisions at the right time." Maine's minimum wage sits slightly above the Federal minimum wage, which is $7.25.